Michelin has launched the MEMS (Michelin Earthmover Management System) Evolution3, an advanced tire-related data sensing and transmission system. The system is useful in situations where 200-tonne trucks worth $3.5 million carry loads as great as 400 tonnes up steep slopes. The machines operating in surface mines work under the most difficult and demanding conditions. Here, the slightest problem takes on extreme technical and operational dimensions. For the operators in these mines, equipment downtime is the worst scenario. On these vehicles, changing a tyre more than 4 m tall and weighing 5 tonnes often requires more than 8 hours of work. 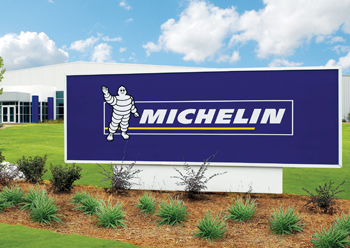 “A pioneer in mining tire monitoring technology and one that introduced the first TPMS (Tyre Monitoring Management Systems), Michelin is with MEMS Evolution3 launching the communicating tyre into the world of mining,” a Michelin statement said. “Given extreme conditions of use, sensor reliability is paramount in the trust that mining operators place in the system. • Monitoring of each tyre through a unique identifier, which allows analysis throughout its entire life to improve performance in the mine. • Real-time data recording, allowing reactive monitoring of alarms. It adds that slow pressure losses are detected and downtime can be anticipated and avoided.Temperature increases are reported, which allows operators to change itineraries in real time. If needed, maintenance operations are also more easily foreseen. The effective running time of the trucks is thus increased. Michelin has provided MEMS Evolution3 with a complete range of services: MEMS engineers are present in geographical areas where equipped machinery operates. “MEMS Evolution3 enables mine operators to enter a virtuous circle: increase safety, increase the life of the tyres, reduce costs and increase mine productivity,” the statement said. In other Michelin news, the company highlighted at the 2015 International Paris Air Show the special relationship it has with one of its partners, Dassault Aviation. Michelin is the exclusive supplier of Air X tyres with NZG technology for the Dassault Falcon 5X and Falcon 8X aircraft. Michelin has also developed for the Rafale military jet the Michelin Air X radial tyres.